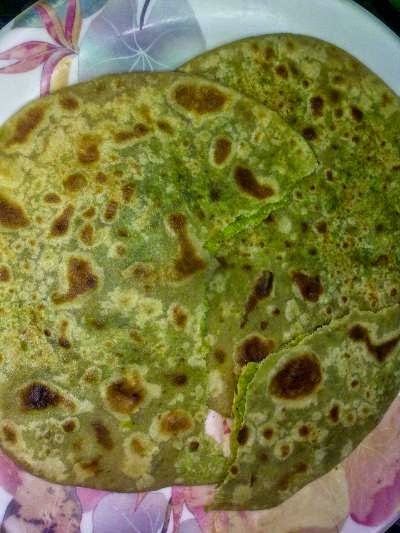 This lip-smacking paratha is a better option if you are not in a mood to have deep fried kachoris :) What I mean to say is with the same inside stuffing of peas, you can have stuffed puris/kachoris or parathas.Not much ingredients required and yet you can enjoy this unique stuffed paratha..
Knead the flour with some salt, oil and water. Keep the dough aside covered. Grind the peas with some green chillies and ginger to a paste. Do not add water, let it be dry. Dry roast some dhaniya and jeera seeds and grind them to a powder. Add ghee. Once hot add hing. Now add the ground paste and stir. Add the freshly ground masala, salt as per taste and a pinch of sugar. Let it cook for some more time. Once done, remove it from flame and let it cool. Make balls out of the dough. Add stuffing inside each ball. Roll into a roti with the help of a rolling pin. Heat a tawa and fry the paratha on both sides with ghee.